During the 1950’s, when ambitious footballers were finding opportunities throughout the length and breadth of this vast continent, John Desmond Sullivan – better known as Jack Sullivan – confined his career to the northern suburbs of Melbourne. A tough and determined wingman who wore guernsey number 30, Jack played 66 matches for Carlton over six seasons between 1955 and 1960. Later, he captained VFA heavyweights Coburg as a dashing back pocket. 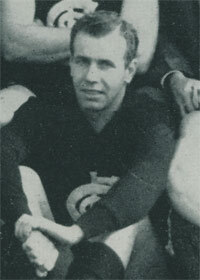 Sullivan joined Carlton’s Under 19 squad in 1950 from St Joseph’s CYMS via North Coburg, and served a long apprenticeship. Forced to wait until round 3, 1955 before gaining senior selection, he went on to play 12 senior matches in his debut season, and was one of the few positives to come out of a forgettable year for the Blues. In 1957, Sullivan made his first and only appearance in a VFL final when Carlton lost an historic Semi Final to Hawthorn. Continuing into September for the first time since joining the VFL in 1925, the Hawks upset the Blues by 23 points - thanks to the match-winning brilliance of their star Brendan Edwards, who was far too good on the day for Carlton’s wingers Sullivan and Graham Gilchrist. By 1959, Sullivan was a regular with Carlton Reserves, where his experience stood out and he won successive Best and Fairests in 1959-60. Earlier in that final year, he announced his retirement from VFL football, and was given a send-off senior game in round 18, against South Melbourne at the Lake Oval. In an entertaining contest, the Blues trailed at half-time, but got well on top in the second half and cruised to a 19-point victory. After transferring to Coburg in 1961, Jack settled into a back pocket, where his flair and experience made him a respected leader of the club. Best and Fairest in 1962, he was appointed captain of the Lions in 1963, under former Fitzroy coach Len Smith. However, the partnership only lasted one season. When Smith was lured back to the VFL to coach Richmond in 1964, Sullivan also stepped down and spent his final season as vice-captain under club stalwart Brian Barclay. The 688th young man to represent the Carlton Football Club in the VFL, Jack Sullivan passed away on the 2nd September, 2002, aged 69. Contributors to this page: Bombasheldon , pblue , PatsFitztrick , tmd1 , true_blue24 , p(12)terg , molsey , Jarusa , nikki and admin . Page last modified on Friday 19 of April, 2013 23:32:54 AEST by Bombasheldon. 1998 Rd 1 - The Great Carlton Con.